Oh, me and my vegan brownies. I'm never satisfied. I've made multiple recipes. Tried a variety of techniques. Experienced explosions in the oven. Smoking with a clear separation of chocolate from oil (gross). And some better confections . . . 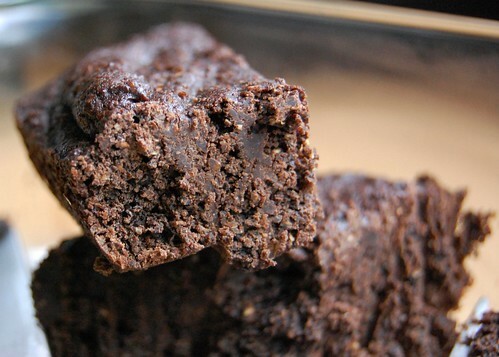 Always resulting in SOMEthing, but never a brownie I entirely love. I think I'm getting much closer -- or perhaps have arrived at the best recipe yet. 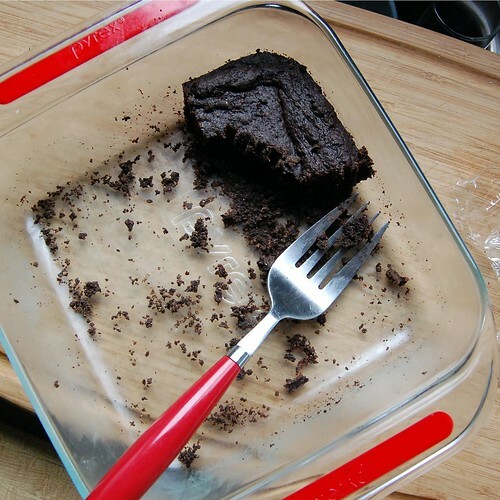 My alternate title for this post was: So-good-they're-gone brownies. Because I couldn't seem to snap a good photo before the majority of the pan was devoured by us. Pulling from my many brownie-baking experiences, I took the good from the recipes I've tried and combined them all. I also added a nice squeeze of fresh tangerine juice for good measure. And as with any brownie recipe, the key to tastiness is good quality chocolate -- and boy did I go fancy on this one. 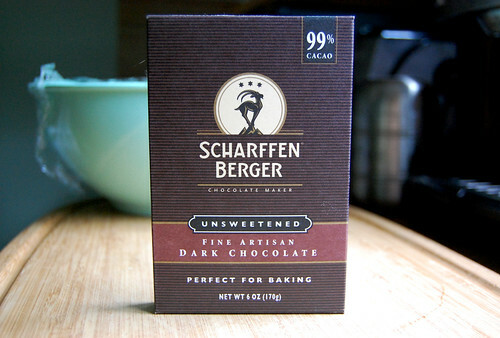 I was happy to pick up this 99% cacao bar made by Scharffen Berger. Ingredients? Cacao beans and whole vanilla beans. May contain traces of sugar and soy lecithin. Simple (and vegan) as that. My only critique of this recipe is that the final product is better consumed cold or heated up. Room temperature tends to carry a crumbly texture. 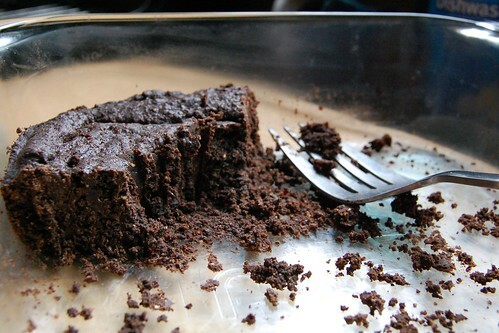 Not crumbly dry, but crumbly moist (ick, I hate using that word -- but it's the best way to describe). If you try this recipe -- you should try using half unbleached white flour and half whole wheat pastry. I'm almost certain that will fix the problem. But please let me know. Lightly grease an 8" by 8" (I used glass) baking dish. Preheat oven to 350 degrees F.
Place Earth Balance and chocolate in a heatproof bowl and microwave in 30 second increments -- stirring in between until melted. Then mix in the cocoa powder and sugar, too. Set aside to cool a bit. In a smaller bowl, whisk together the flax meal and water, set aside for 4 minutes. Then add the tangerine juice and whisk until well combined and ever-so slightly frothy. 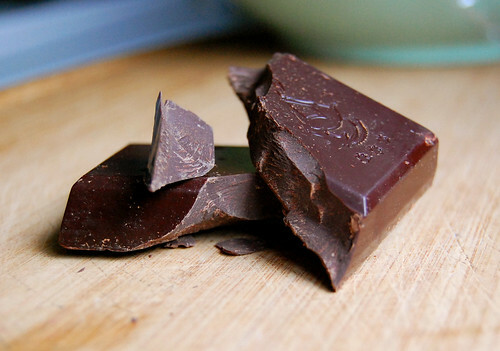 Add chocolate mixture to these wet ingredients and mix until well combined. Add flour mixture to this wet mixture. Use a spatula to mix until JUST combined. Pour batter (try not to eat it all) into the square pan and spread evenly with spatula. Bake for 35 minutes. Check them after 35 minutes –- if you can stick a knife in without it coming out gooey, you're good. If not, continue baking for another 5 to 10 minutes. Mine took only 38 minutes total. Let cool. I left my brownies in the pan and covered with plastic wrap in our fridge for storage.